Copyright: ©2014-2019 Norddeutsche Hörbücherei e.V. Copyright: ©2017-2019 Norddeutsche Hörbücherei e.V. 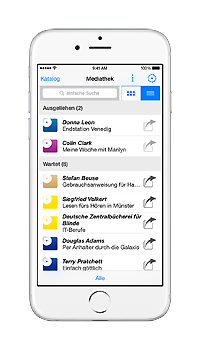 The BliBu app from the North-German Audio Book Library for blind, visually impaired and people with reading disabilities (Norddeutsche Hörbücherei für blinde, seh- und lesebehinderte Menschen) and the Foundation for the Central Library for the Blind (Stiftung Centralbibliothek für Blinde) enables you to browse and research our braille, audio, and audio film catalogues, order books, and manage your order lists via the media library, making it possible for you to access your user account with us now not only from home, but whenever you like with your iPhone, iPad or your Android Device. Note: Only people with proven visual impairment are permitted to borrow audio books from the North German Audio Book Library for the Blind.